An industrial robot is a general-purpose, programmable machine possessing certain anthropomorphic characteristics. Mechanical arm is the most common characteristic of an industrial arm and is used to perform various industrial tasks. Making decisions, capability to communicate with other machines, and capability to respond to sensory inputs are the important attributes of an industrial robot. These capabilities allow the robots to be more versatile in nature. It involves the coordinated control of multiple axes (joints) and use dedicated digital computers as controllers. (i) Robots can be substituted for humans in hazardous or uncomfortable work environments. A robot performs its work cycle with a consistency and repeatability that cannot be attained by humans. (ii) Robots can be reprogrammed. When the production run of the current task is completed, a robot can be reprogrammed and equipped with necessary tooling to perform an altogether different task. (iii) Robots are controlled by computers and can therefore be connected to other computer systems to achieve computer integrated manufacturing. Robots having cartesian configurations consist of links connected by linear joints (L). As the configuration has three perpendicular slides, they are also called rectilinear robots. Robot having a similar configuration is known as Gantry Robots. Its structure resembles a gantry-type crane. In the cylindrical configuration, robots have one rotatory (R) joint at the base and linear (L) joints succeed to connect the links. The space in which this robot operates is cylindrical in shape, hence the name cylindrical configuration. Polar robots have a work space of spherical shape. In general, the arm is linked to the base with a twisting (T) joint and rotatory (R) and or linear (L) joints. The designation of the arm for this arm can be TRL or TRR. Robots with the description of TRL are also called spherical robots. Those having the designation of TRR are called as articulated robots. It resembles a human arm in terms of configuration. The combination of cylindrical and articulated configurations is known as jointed-arm configuration. The arm of the robot is connected to the base with a twisting joint. Rotatory joints are used to connect the links in the arm. Generally, the rotation takes place in the vertical plane. Popular robot falling under this category is called SCARA (Selective Compliance Assembly Robot Arm). It is basically used for the assembly purpose. The PTP robot is capable of moving from one point to the other point. The locations are recorded in the control memory. The paths are not controlled by the path guide. Instead the desired path is traced by programming a series of points. 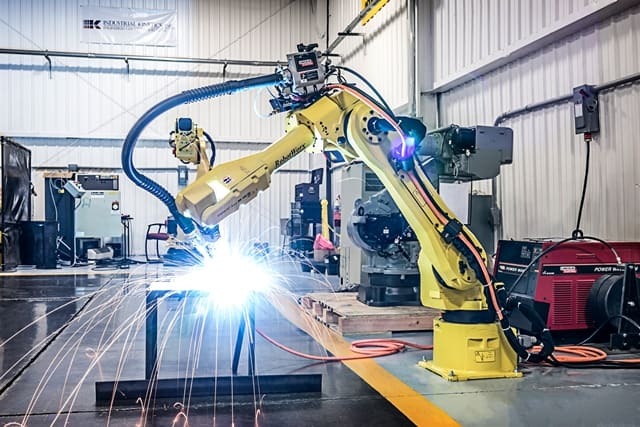 Component insertion, spot welding, hole drilling, machine loading, unloading and crude assembly are some of the common applications of this type of robot. The movement along the controlled path is performed by the CP robot. Along the controlled path, with CP control, the robot can stop any specified point. In the robot’s control memory, all the points must be stored explicitly. Straight-line motion is being carried out by these types of robots. Some continuous-path controlled robots also have the capability to follow a smooth curve path that has been defined by the programmer. Here, the programmer manually moves the robot arm through the desired path and the controller unit stores a large number of individual point locations along the path in memory. In controlled-path robots, the control equipment can develop paths of different geometry such as straight lines, circles, and interpolated curves with a high degree of accuracy. Good accuracy can be obtained at any point along the specified path. Only the start and finish points and the path definition function must be stored in the robot’s control memory. It is important to mention that all controlled-path robots have a servo capability to correct their path. Application of the robots in the industry must be technically and economically viable for the industry.